I'm currently loving hot pink, well actually I always love it; I just feel I love it more lately. Have you seen the new jcrew catalog? Hot pink is everywhere! Must be a new trend? And for you girls who don't like to rock pink on the regular, remember Valentine's Day is fastly approaching! You don't want to be caught off gaurd! I would love to add any of these to my closet!! Jcrew continues to provide me with things I "need"! This week's Friday's Fanices theme is color crush.. I am a bit late but I had to share my love for hot pink!! 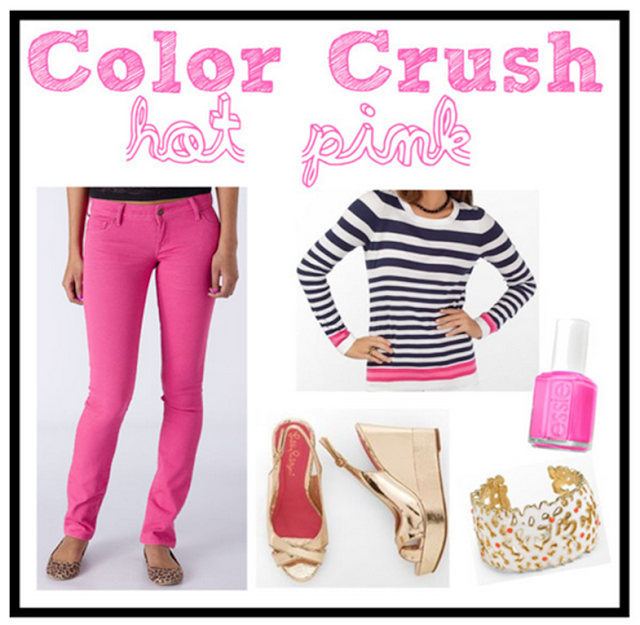 I think one of the cutest way to wear hot pink jeans is a navy striped shirt with some gold accessories! And you know you can always find me in hot pink nail polish, no matter the time of year. 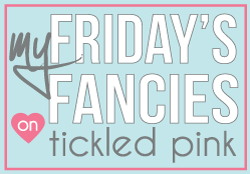 Hope everyone has a fab weekend and may you be tickled pink! I love pink! Hope you're having a great weekend! I love pink, too! Wish I had some pants that color! That J. Crew blouse is so gorgeous!! Love the pink!!! I got some cheap pink jeans from B.P. section of Nordstom! I keep seeing such great pink button up tops. I need to invest!